A public town hall event held over the weekend to discuss the future extension west of Arbutus Street consisted of presentations by panellists, including TransLink Vice-President of Infrastructure Management and Engineering Sany Zein, City of Vancouver Chief Engineer and General Manager of Engineering Services Jerry Dobrovolny, and UBC Associate Vice-President of Campus Planning Michael White. The speakers argued for the need for a tunnelled solution, not street-level light rail transit (LRT) or more buses, for the second phase towards UBC. “We tried to introduce more buses on the 99 B-Line, but they started interfering with each other and slowed each other down. We have reached the limit of what buses can do,” said Zein. Over 40 articulated, three-door buses are already in use on the 99 B-Line during the busy peak times, with buses departing every two or three minutes. But an underground SkyTrain extension would increase the capacity by 250% over the existing B-Line, with a starting capacity of 7,100 people per hour per direction (pphpd) upon opening. LRT running at street-level is not an option either due to the surreal passenger volumes anticipated and its inability to meet the long-term demands of the Broadway Corridor, without negatively impacting the street. Dobrovolny furthered on Zein’s point by later stating that the trolley bus system already carries 10 times the number of people the Portland streetcar system carries. Furthermore, a fully tunnelled SkyTrain extension to UBC is expected to see an opening day ridership of at least 250,000 people – about two-and-a-half times the opening ridership of the Canada Line about a decade ago. “It isn’t that one technology is good and one is bad. They are all great, they are all part of transit. They are all different, and they all have different advantages and disadvantages. It is really important that we fit the right technology that fits the corridor and the need,” said Dobrovolny. He noted that while some street-level LRT systems elsewhere in the world carry more people, these systems also run at high speeds along medians between freeways and are very long trains, but this is not possible along the Broadway Corridor. However, he asserts that a lower-capacity type LRT system is suitable for some of the other areas of Metro Vancouver where a rapid transit route “slowly diminishes off into suburbia” and runs into less density. “In the case of the Broadway Corridor case, you don’t have that. You have this big behemoth on the other end of the system called UBC, and so because of that you have a city at the end of the line and that generates tremendous demand,” he said. Construction associated with a street-level LRT system would have a major impact on the activity on the street and businesses, as the entire road would have to be rebuilt. Dobrovolny says City Council has not made a recommendation to TransLink on the type of technology that should be built beyond Arbutus Street, but he says studies currently underway indicate it should be a continuation of SkyTrain. “The new [tunnelled] system will be incredibly efficient because you have reliable travel times you can count on and use. That is why you attract so many more people with the SkyTrain system because you have that grade separation and reliability,” said Dobrovolny. To get the tunnelled train to UBC, as previously proposed, White maintained that the university is willing to help fund construction to the campus, but it will be through non-academic funding generated possibly through development charges and land contributions. It wants to see two stations on its campus – a station near the intersection of University Boulevard and Wesbrook Mall to serve the campus core and the terminus station near UBC Wesbrook Village at South Campus. The population of the campus will only continue to grow; there are currently about 12,000 student housing beds, and the university wants to accelerate its student housing supply. This does not include the campus neighbourhoods, where there are another 12,000 residents. This figure alone will double over the coming 15 to 20 years. “We’re [already] about the size of the city of Kamloops during the day,” said White. 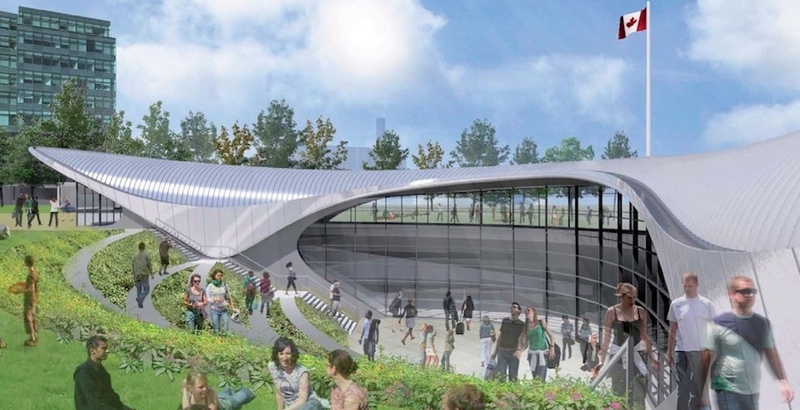 Construction on the first phase of the subway – six km and six stations at a cost of $2.83 billion – between VCC-Clark Station and Arbutus Street is anticipated to begin in 2020 for an opening in 2025. UBC wants the region’s decision-makers to secure funding for the second phase to the campus by 2021 for an opening in 2028, with the assumptions of a design and construction timeline of five to seven years. When complete, it will take just 11 minutes to travel from VCC-Clark Station to Arbutus Street. A further extension to UBC from Arbutus Street will have a travel time of about 10 minutes.